"I am taking the opportunity provided in the appointment of this third International Baha'i Council to identify my appointed successor. His identity is found in the one whom I have designated below as the single Vice President of the Council who will succeed to the Presidency, and thereby the Guardianship, upon my passing, or prior thereto, in the event of any incapacitation in the future that may preclude my being able to continue functioning as the Guardian of the Faith, either as determined and announced by myself or, if unable to make such a determination, as may be announced by my successor on the basis of a decision rendered by competent medical authority." Nosrat'u'llah Bahremand the eldest son of Dr Hassan Bahremand a prominent faithful and steadfast Baha'i; was born in Shiraz in 25 August 1942, at the age of four with the family moved to Tehran and grew up there. 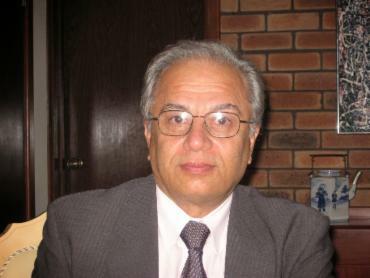 He studied administration in Tehran University and worked in the Ministry of Housing. After revolution in Iran, he lost his job for being a Baha'i, eventually he moved to Australia in 1988. Be advised that upon the termination of my ministry, the Guardianship will again be in the hands of the Persian believer whom I have appointed as my successor and who is identified below." … "While it is understood that the Will and Testament of 'Abdu'l-Baha does not require the incumbent Guardian to appoint a Persian as his successor and that the race and nationality of the Guardian is not a consideration in this appointment, future Guardians of the Faith in the centuries that lie ahead will undoubtedly represent many races and nationalities, the Persian believers will be pleased to learn that the present Guardian has appointed a Persian believer as his successor. His father, a resident of Tehran, had never believed that the Guardianship of the Faith had ended with the passing of Shoghi Effendi in November 1957, as he had never wavered in his faith in the indestructibility of the Covenant of Baha'u'llah or accepted the view that the major and immutable provisions of its immortal and sacred "Child"––the Will and Testament of Abdu'l-Baha––had become null and void. The steadfastness of his faith was rewarded when he recognized and accepted Mason Remey as Shoghi Effendi's successor upon the receipt of his Proclamation at Ridvan, 1960. His son, Nosrat'u'llah Bahremand, also accepted his Guardianship but had never received information as to the identity of Mason Remey's appointed successor. Notwithstanding, he remained steadfast in his belief that the continuance of the Guardianship of the Faith had been assured down through the ages to come of the Dispensation of Baha'u'llah. There is therefore no doubt that, because of his steadfastness in the Covenant, God decreed that he would be guided to leave Iran some years ago and make the decision to settle in the distant city of Perth, Australia, where unbeknownst to him the living Guardian of the Faith then resided, and where he would finally discover that his unwavering faith in the Covenant would, at last, be fulfilled and where he would find, accept and embrace the third Guardian of the Faith in person, while sacrificing, in so doing, his livelihood, the painful severance from members of his family and previous relationships with his fellow-Baha'is who did not follow him in the acceptance of my Guardianship. This dedicated, devoted and exemplary Baha'i, Nosrat'u'llah, Bahremand, well versed in the Teachings and in the provisions of the Will and Testament of 'Abdu'l-Baha, and the writings of Shoghi Effendi and those of his successors, has been deservedly appointed Vice-President of the third International Baha'i Council that I appointed on 22 September 2006 and, upon the termination of my Guardianship, my chosen successor.